The best way to introduce dogs is by doing it slowly. See the Dog Expert's advice to one visitor. I'm looking for advice about how to introduce a "new" dog to my "old" dog. I have a six-year-old male Pug and I'm "expecting" a five-month-old Puggle next Friday. This is my second attempt to bring another dog into the home since we lost our best friend last January. My Pug has been depressed ever since, and I also miss her desperately. Last week I brought a two-year-old shelter dog home. She weighed less than my Pug, but she was taller, stronger and faster than he was, and he reacted rather badly. He was scared to death of her, and she completely overwhelmed him. She tried playing with him, but was quite aggressive about it. He ended up going after her a couple of times. She was a good dog, but she was just too much for him, so I took her back to the shelter the next day. I've since been told that I didn't introduce them correctly, and that I should have brought them both to neutral territory so he didn't feel as threatened. This is probably true, but I still believe she would have been too much for him regardless. So, I decided what I needed was a younger, smaller dog that wouldn't be as intimidating. The Puggle weighs about eight pounds less, and is maybe two inches shorter than my dog. Here's hoping it's love at first site! Should I still introduce them in neutral territory? Also, what should I do about sleeping arrangements? The Pug sleeps in my giant California king-sized bed, and there's plenty of room for one more. Do you think this would freak him out too much on the first night? If yes, where should the new dog sleep? I want to make this transition as easy as possible for both of them. In fact, I want it to be fun for both of them. Yes, it is always better to introduce two dogs on neutral territory. This lessens the aggression that either dog may need to express when on its own home turf. Introductions also need to be done slowly. It's never a good idea to turn two dogs loose on each other to figure it out. 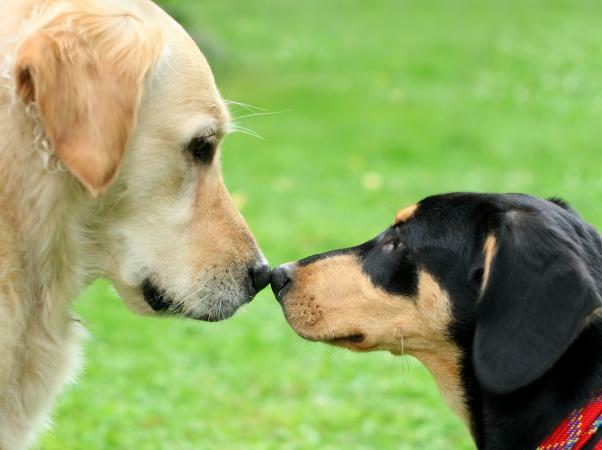 It's better to let the dogs get used to looking at each other from a distance first, then slowly move together letting them sniff each other. Next, rather than turning them loose to play, it may be a better idea to take them both for a walk together on leash. This gives you an opportunity to remind them that you are the "top dog" in this pack, and also gives them a chance to settle in next to each other. If there are any shenanigans during the walk, simply give one or both dogs a quick upward tug on the leash to remind them of their manners. When you bring the dogs home, offer them both water from separate bowls, and leave the food until later after they've had a chance to settle down some more. Your new pup will want to investigate her new home. Depending on how well they are getting along by evening, you might be able to allow the new pup to share your bed. However, this really might be too soon to expect your male to share his "special" territory. If he becomes overly stressed about it, he may feel a need to become aggressive over his territory again. It may be better to have a crate prepared for the new puppy for at least the first couple of nights. The one thing I want to stress is that it's going to take more than a single day for the dogs to work out the new situation. They will decide which one of them is going to be the dominant one in this new relationship, and your Pug may actually become submissive to the newcomer so be prepared for this. I think going with a puppy is a good choice because she'll handle the changes easier than an adult dog would. Hopefully this pairing will work out. My very best wishes to all three of you. Good luck!